Premium Compatible Label Tapes for the Brother P-Touch 1250S printer. The Brother P-Touch 1250S is a monochrome label printer that can be a useful product for home, office, business or workshop. 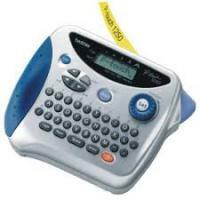 This label printer consists of functional navigation buttons that control the printer and help in its easy working. The Brother P-Touch 1250S is very lightweight and weighs 0.4 kg. This label printer is 6.4 cm in height, 15.4 cm in width and 12.9 cm in depth and has a printing speed of up to 10 mm/sec with a resolution of up to 180 dpi x 180 dpi. This label printer supports 5 character sizes and 8 styles and features a two line printing. This label printer has a display resolution of 1 line x 8 characters. This label printer supports a standard maximum media size of 1.2 cm x 8 m and custom maximum media size is 12 mm. The Brother P-Touch 1250S supports a QWERTY keyboard having 39 keys. This label printer has a total media capacity of 1 roll and can print 9 copies at a time. The compatible Brother P-Touch 1250S Label Tapes with the printer are Brother TZ tapes. The Brother P-Touch 1250S label printer is good for homes and offices. It uses black and white Brother P-Touch 1250S Label Tapes as it is monochrome printer. These label tapes have low running costs in comparison to toners. This label printer has a very small footprint but has impressive features. Q. When I turned on the machine I found out that the stored text files in the memory are all gone. Later when I tried to print labels with my Brother P-Touch 1250S machine The characters were not formed properly onto the labels. What is wrong with my printer? Do I need to call someone from the Brother for the problem? Or can I fix this myself? Please help. Finally, put the tape cassette back in place and close the back cover firmly. Remember all the text files stored in the memory and the text and format displayed on the screen will be lost if you do not replace the batteries within three minutes of duration or if the printer is not connected through an AC adaptor. Also if you do not want to install new batteries you have an option to connect the printer to an electrical outlet through AC adaptor. Q. I am looking out to buy Brother P-Touch 1250S label tapes in bulk. So, do you have any discount offers available for the product? A. If the discount offers are available with the product you can avail it during the time of purchase. The offers keep changing and so we cannot assure that the offer will still go on during your purchase. Brother P-Touch 1250S label tapes are provided by our website at a very reasonable price. Additionally, you can avail the ‘money back guarantee’ offer if you are not satisfied with the product. Please visit the particular Brother P-Touch label tape page to know if any discount offers are available. For more details, you can call our customer support on 048 30833221. Q. What is warranty on the batteries that come with Brother P-Touch 1250S? A. The original batteries from Brother come with a warranty of 3 years. Q. I created a label for one of my household things using self-adhesive Brother P-Touch 1250S label tape. But after just a day the label came out of the place? Why did this happen? Are the Brother P-Touch 1250S label tapes faulty? A. Please ensure that the Brother P-Touch 1250S label tapes are not applied to the rough or irregular surface. If you do so the self-adhesive labels will not stick onto the place firmly. The self-adhesive label tapes are manufactured to be used only on smooth surfaces. Q. Do you provide original Brother P-Touch 1250S label tapes? A. No. We do not supply original Brother P-Touch 1250S label tapes. However, the compatible label tapes supplied by our website are equally brilliant in quality as the original ones. You can try using a compatible label tape once. If you are not satisfied with its performance you can return the product as per our return policy and get the refund. If you want to know more about the return policy, please have a look at our ‘RETURN POLICY’ section from below.